The webservice allows you to upload your local/regional waveform data and to invert/model them in terms of Focal Mechanism (FM). Computation is carried out remotely at Géoazur and the results can be visualized and/or downloaded on your local computer. 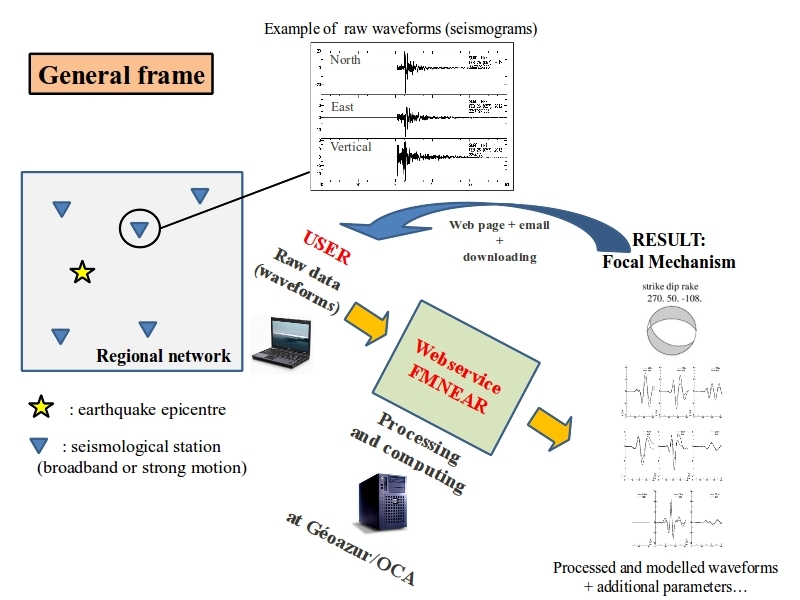 The scientific codes were developed by Bertrand Delouis (NERA project) and the webservice was built by Jérôme Gérakis (Virtual Observatory, OCA), under a framework defined by Bertrand Delouis and Anne Deschamps. If you publish/show results obtained with this webservice, please include reference "FMNEAR webservice, Delouis, Gerakis, Deschamps, Geoazur/Observatoire de la Côte d'Azur". Concerning the method FMNEAR, please include reference to the article: "Delouis, B., 2014. FMNEAR: determination of focal mechanism and first estimate of rupture directivity using near source records and a linear distribution of point sources, Bulletin of the Seismological Society of America, 104 (3), 1479-1500, doi:10.1785/0120130151."